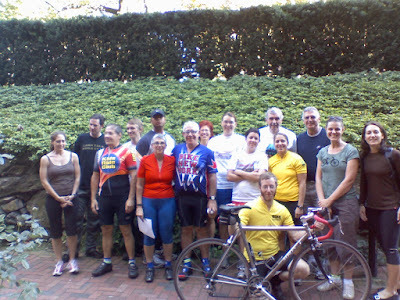 Friday, Saturday and Sunday I took the League of American Bicyclist's Cycling Instructor course (it's call LCI). A very intensive almost 30-hour class which certifies people in how to teach a variety of cycling classes. I arrived to class on Friday having had a bad headache for most of the day. As each moment passed in class, hour after hour, I alternated shivering tremendously and burning up. After 10 pm, I got home and realized I had about 103-104 degree fever. I loaded up on all things fever-fighting (thank goodness I had a prescription for antibiotics I'd just filled) and headed off to bed. Saturday I woke up tired, having had night sweats all night, but made it through the day on my antibiotics and Tylenol. The fever didn't return. Before the class started, we were issued an at-home test covering everything from bike maintenance, traffic law, pedaling/cadence, nutrition, everything. There were 85 questions- including about 10 short answers that were actually essay questions. We each had to earn a score of 85% and 85% on the different sections to pass. I earned 84% and 85% but after asking me one bike-related question, the instructor felt comfortable with my knowledge to pass me. Phew, close one. But I did better than the vast majority of the class. Only two other people passed that test. 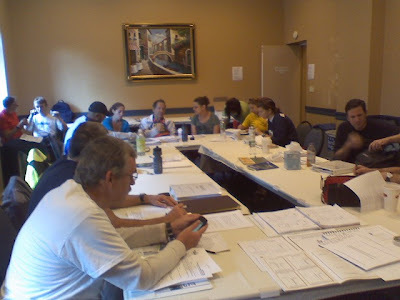 Through the course of this class, each of the 18 participants had to teach two mini-modules, or mini-lessons. I was assigned "Intersection Positioning" and "Riding a straight line/Gearing"- for my lesson I had students do an activity where first they had to draw a bike, or write "bike" if they didn't want to draw. 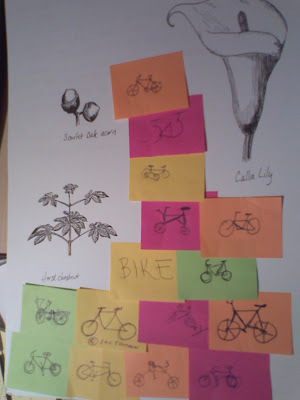 I loved their little post-its so much I asked to keep them- what cyclists has never doodled a bike? Together, they look like art, so I put them in my sketchbook. I was happy there was a teaching component because being a teacher, I was comfortable and extremely well prepared in a room of mostly non-teachers. Several people said they'd steal my lesson for when they taught it too and that is the best- very flattering. This guy's name is Eric Thumann- he rides an internally shifting 3-speed steel bike from 1966. It was beautiful and it's been all over the world. He is without question one of the coolest people I've ever ever met. 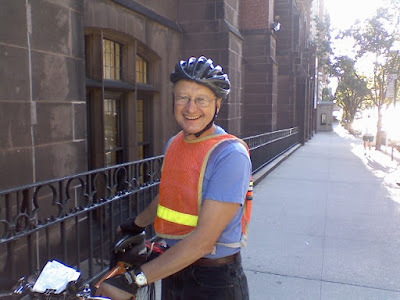 We talked botany, we talked bikes, his happiness and disposition were contagious. Really, it was like an older male version of myself. We did two early-morning rides to show the LCI who was rating us we knew how to signal, execute proper road positioning, avoid/handle obstacles, etc. We did a night ride and were evaluated on our visibility and how we outfitted our bike (I looked like a Christmas tree/landing strip I had so many lights). We did hours upon hours of skill drills which we had to execute with mastery- rock dodges, avoidance turns, slolams, quick stops- that sort of thing. We even had to ride our bikes with our butts completely off the back end of the bike- just a few inches above the wheel- I've since named this move the nutcracker. We had to show we could get into that position, pedal, and stop. I learned it was much easier if I just laid my abdomen on the seat- I was so comfy I could've taken a nap. 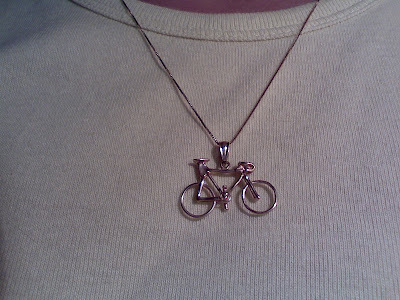 The site coordinator brought in a box of jewelry that her friend had given her- apparently she wasn't the bike-jewelry kind of gal but had received a few things as gifts that she'd never wear so she was giving them away. I received this beautiful gold bike which I adore. What a great thing, I really cherish it already. After this extremely long and sometimes tense weekend, several people from the class and I decided to go for a real ride through Manhattan. We took a leisurely path down the Hudson River Greenway, to WTC and then back up through the most-heavily trafficked parts of Manhattan. It was exhilerating and frightening at the same time. I think my favorite part of the class was meeting people from so many different organizations- people working with students in the bronx, the deputy director of bicycle and pedestrian programs from the DOT, I Challenge Myself teachers, New York Bicycling Coalition- oh and a guy who works for Recycle-A-Bicycle. I tried to hit him up for a well-loved fixie but he said they don't have any. That saved me a trip into the city another day- I was planning to buy one. So there you go, I'm now a certified cycling instructor with several more trainings already in the works. It's a good thing.